The new General Data Protection Regulation (GDPR) will apply from 25 May 2018 in the EU: it’s time to make your e-shop comply with the regulation’s provisions. Download your White paper - GDPR Key Info for free to know how to be prepared for this regulation. The Official GDPR Compliance by PrestaShop module offers you a complete solution to bring your store into compliance with the EU regulations ! For PrestaShop 1.6, Module available here ! 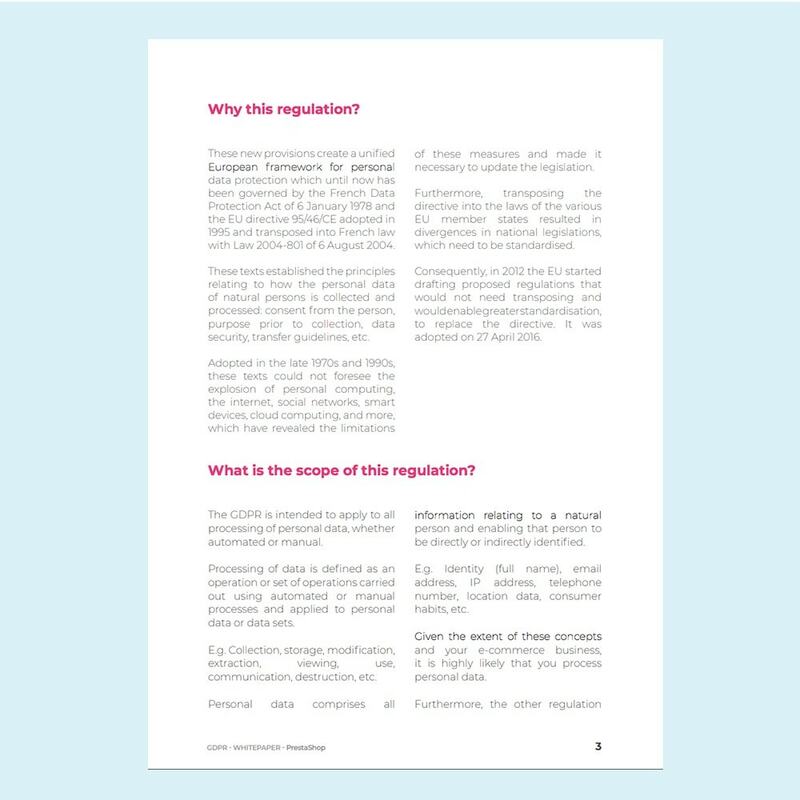 White paper - GDPR Key Info made and offered by PrestaShop aims at guiding you on how to comply with this European regulation. It provides all the answers to meet new obligations relating to the processing & using of personal data collected by your e-shop. You will find the GDPR principles, the scope, e-shoper recommandations & obligations. In brief, all you need to know to implement measures that make your e-shop comply with regulation and protect you from dispute. This White paper - GDPR Key Info is also available in French.